Your BRIGHT choice in Strobe Lighting. 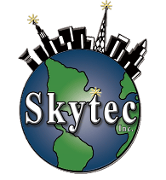 Skytec is your source for parts, service and repairs of all types of obstruction strobe lighting. We stock an extensive supply of parts for all types of aviation warning lights installed on chimney stacks, towers, and tall buildings. We carry thousands of parts for systems manufactured from the 1970s to today. With over 40 years of experience and expertise, we have become highly respected in the industry and are the total solution to your strobe lighting needs. We pride ourselves on quality workmanship and feel strongly that our services will be beneficial to you in a variety of ways. Our parts department stocks flashtubes, boards, trigger transformers, capacitors, photoelectric controls, and relays just to name a few. We offer free technical assistance with our parts purchases to help make your repairs hassle-free. Give us a call in Windham, Maine, to learn more or to place your next order.